Jack Nicklaus, also known as "The Golden Bear", is regarded by many as the greatest professional golfer of all time. Nicklaus' final U.S. Open was held at Pebble Beach Golf Links in 2000, where he shot 73-82 to miss the cut. He has 115 Professional Wins, including 73 on the PGA Tour, 10 on the Champions Tour, and 32 other wins. 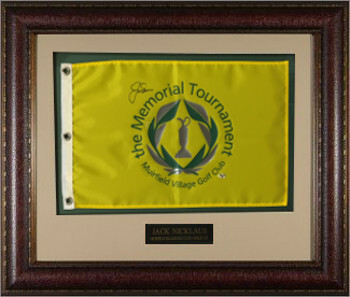 Jack Nicklaus has hand autographed this The Memorial Tournament Flag at Muirfield Village Golf Club, Custom Matted and Leather Framed as shown. Beckett Authentication Services - BAS Hologram # A86279 w/ Beckett Full Letter of Authenticity.